Start with feet together and underarms parallel to the ground. "Lift" the hip by pressing the navel backwards to the spine, and lower the body till slightly bended knees. 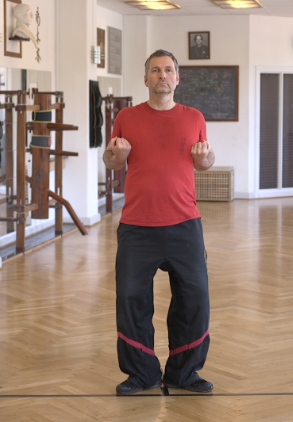 First rotate toes outside, then rotate heels outside, while maintain knee tension by the hip tension. Outer part of heels to be outside the shoulder width. Maintain a slight tension in the stomach muscles, while breathing naturally. Siu Nim Tau 1. Sec. 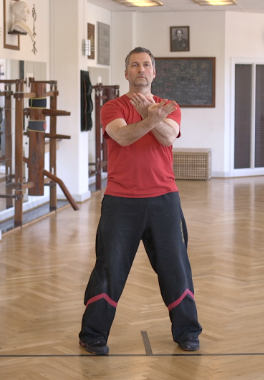 Lower the elbows forward with palms up till wrists are crossing in the Center Line. Cut down into double crossing "Gaan Sau". Wrists presses via internal rotation the elbows outside to double Noi bong, and returns upon pressure release to previous starting crossing arms position. Lower the elbows back to Sau Kuen.